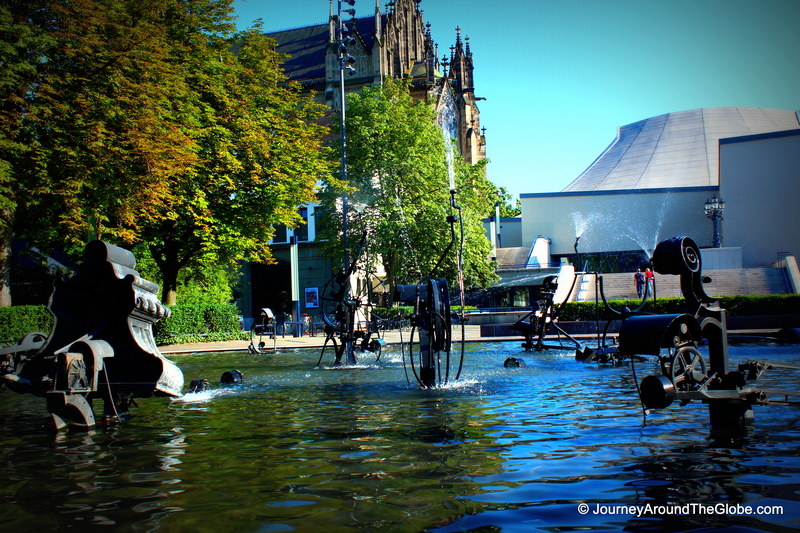 BASEL, SWITZERLAND: Basel is a perfect gateway spot if you have few days to spare in Switzerland. The city itself has many things to explore which includes contemporary architectures, museums, arts, and its famous zoo. In addition to that, the location is great to visit other nearby Swiss cities like Zurich, Bern, Lucerne, Interlaken and regions, like French Alsace, German Black Forest, and finally, the mighty Alps. 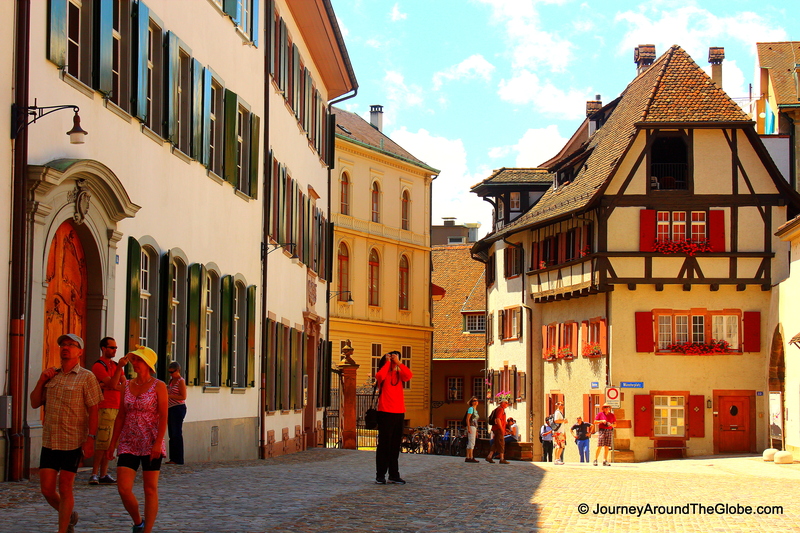 Its medieval old town is a colorful and vibrant place to relax and watch people go by. The main attractions of the city are within walking distance, but trams are very efficient and well-served here. Unlike many other cities, the tickets can be bought right in the bus/tram stops. The official language of the city is German, but I’ve heard people speaking French and most of the locals are very fluent in English as well. One thing to remember when driving on autobahn and entering Basel (or Switzerland) is that you have to pay 40 CHF to get a toll ticket. The ticket is valid for one calendar year indicating on the sticker. 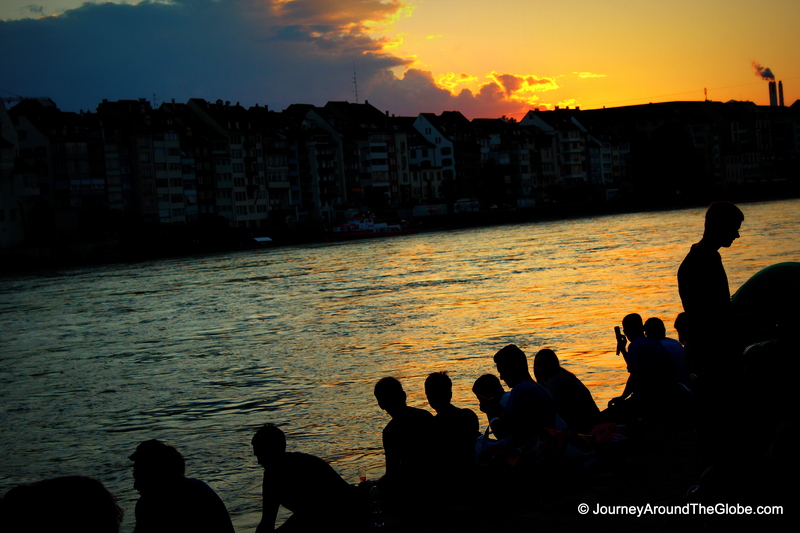 TIME OF TRAVELING: We drove to Basel during first week July, 2012. It was a nice and scenic 5 hours of drive from Tervuren, Belgium. The weather was extremely cooperative, not too hot, not too cold, and luckily, no rain. OUR HOTEL: We stayed in Dorin Hotels & Resorts in Basel. We took tram # 14, which dropped us right in front of Rathaus in Marktplatz in about 7 minutes. The hotel didn’t have free breakfast but free Wi-Fi and paid car garage were perfect for us. The best part of the hotel was that they gave us free tram pass for 4 of us for the duration of our stay. WHAT TO EAT AND BUY IN BASEL: Of course, Swiss chocolates are something to eat and buy in Switzerland. Other than Lindt, “Villars” is a good brand of Swiss chocolates and if you want something original of Basel, then try “Läckerli Huus”. Additionally, Swiss knives, watches (if you have some extra cash to spare), and cowbells are some of the popular souvenirs to take back home. Buying Swiss watches from Switzerland doesn’t mean that you will get them cheaper here, they cost about the same anywhere else in the world. 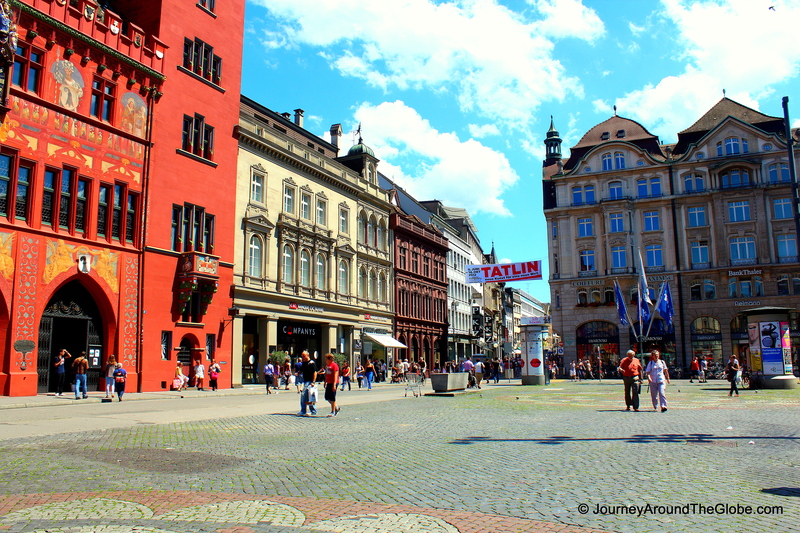 1) MARKTPLATZ & RATHAUS (TOWN HALL): This is the heart of Basel and the center point of everything. Marktplatz is usually very energetic and crowded during the day time with shops full of customers and restaurants packed with hungry or thirsty people. Fresh fruits & vegetables, bakery, cheese, flowers are always available every morning with more vendors on Saturday mornings. Freie Strasse is a lively small street on the right side of Rathaus (when you stand facing it), which has most of the stores and cafes. 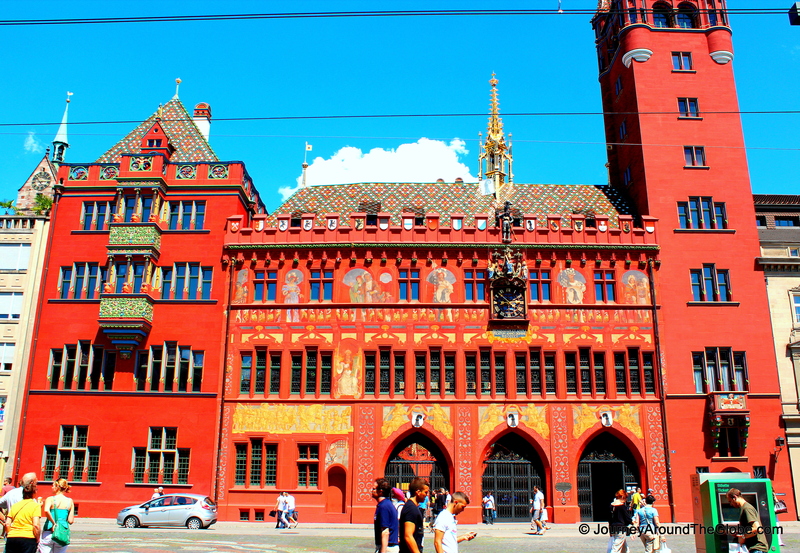 The beautiful red building with Renaissance façade at one side of Marktplatz is the Town Hall (Rathaus) of Basel which catches your eyes the moment you walk into the square. Check out the frescos on the outer wall and detailed design of this building. It’s free to enter the inner courtyard. It is small but the rich colors and designs on the walls are definitely unique and something I have never seen before. The town hall is still in official use; therefore you cannot go in without a guided tour, which is only doable on Thursdays. We didn’t go inside, but really enjoyed the small courtyard and going up the stairs to get an overview of the whole architecture. 2) MÜNSTERPLATZ & BASEL MÜNSTER (CATHEDRAL): This also a part of old town. This is a rather calm and quiet square with a line of several medieval buildings on one side, opposite of the cathedral. We saw only one restaurant in that big square and no shops or anything. It’s less than 5 minutes’ walk from Marktplatz, just walk up the cobbled street (Münsterberg) to Münsterplatz after taking a left from Freie Strasse. River Rhine and a view of Black Forest on the side of the river can be seen by going around the church to its backside. Basel Münster is definitely an important landmark of the city. The cathedral is easily recognizable with its red sandstone architecture and colored roof tiles. The cathedral was built between 1019 and 1500 in Romanesque and Gothic style. 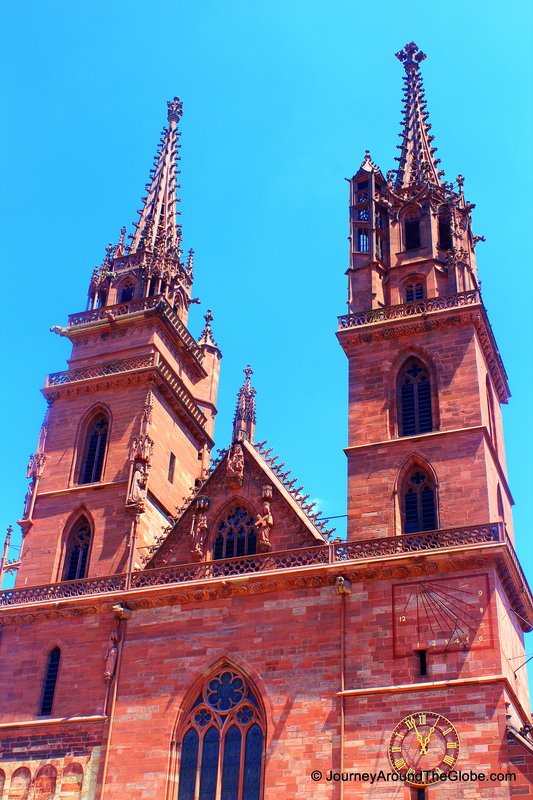 Both the towers of the cathedral can be climbed up by paying only 4 CHF per person and free for kids under 14. 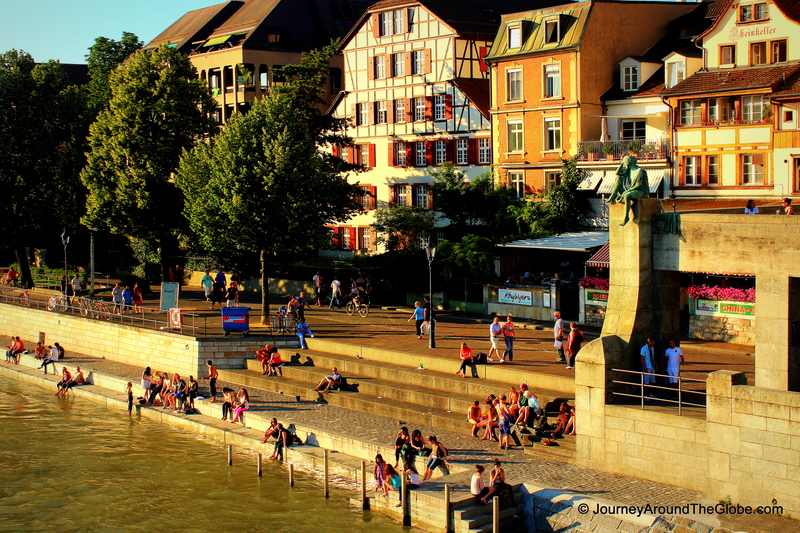 There are 237 very narrow and steep steps to go on top, but once you are there you get a stunning view of the whole city, Black Forest region on the other side of River Rhine, then Mittlere Brücke and Wettstenbrücke (the 2 major bridges on Rhine). 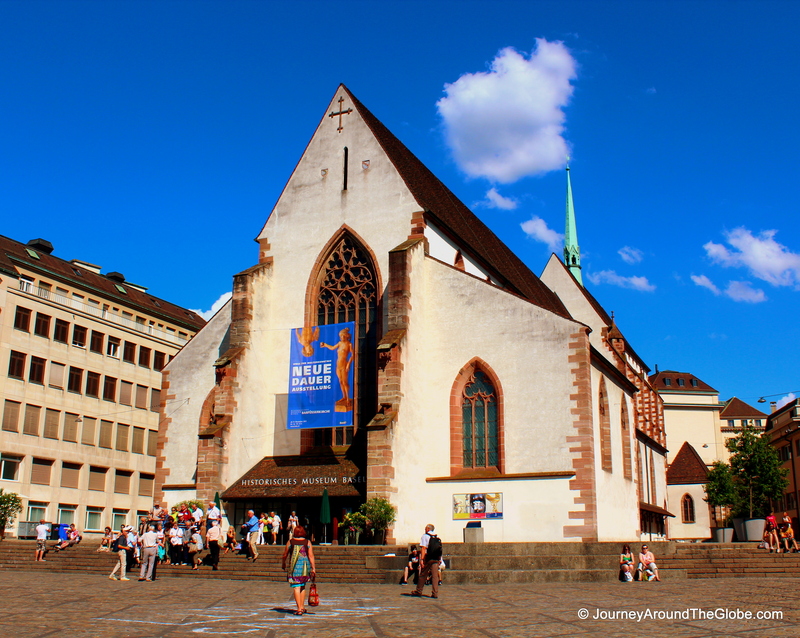 3) THEATREPLATZ & ELISABETHKIRCHEN (CHURCH of ST. ELIZABETH): Theatreplatz is another peaceful square of Basel old town featuring a beautiful, one of a kind fountain, Basel Theatre and Elisabethkirchen. It’s only few minutes’ walk from Marktplatz and Münsterplatz. Elisabethkirchen is a neo-Gothic church, which was built between 1857-1865. By the time we got there, it was closed and therefore, couldn’t go inside. But it definitely looked very impressive from outside. Basel Theatre is situated right beside the church. 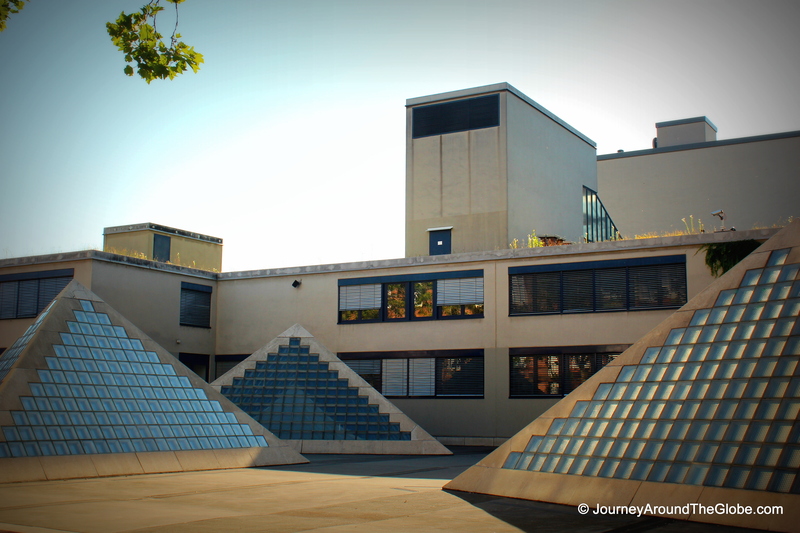 The theatre is a contemporary architecture with four glass pyramids in front…a nice and calm place to hang out. 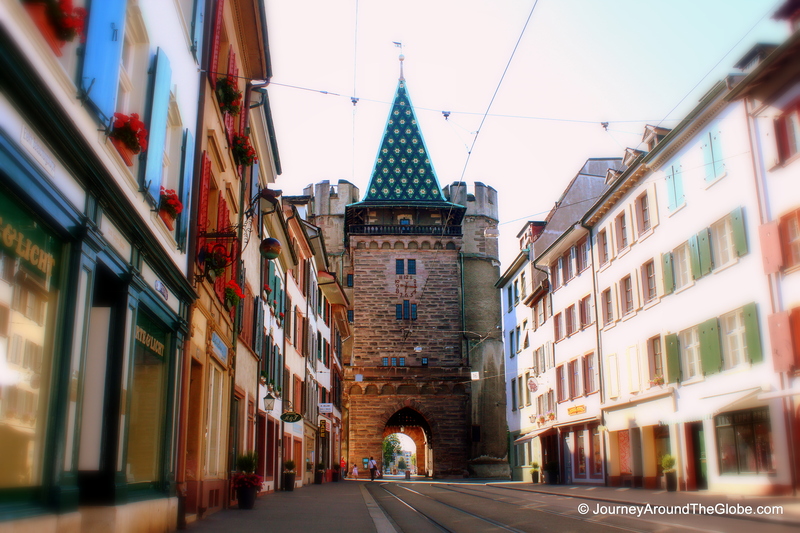 4) SPALENTOR: This is an old city gate and a part of former part of Basel’s city walls. This was built after the great earthquake of 1356. Couple of these gates still exist within which once used to be a medieval city. Tram# 3 from Barfusserplatz takes you right in front of this in just few minutes. There is nothing much to do other than appreciating this beautifully decorated gate with colored roof tile, a small portion of cobbled street, and an old wooden door. 5) PUPPENHAUSMUSEUM BASEL or SPIELZEUG WELTEN MUSEUM (TOY WORLD MUSEUM BASEL): This is an awesome and only one of its kind museum in Europe. 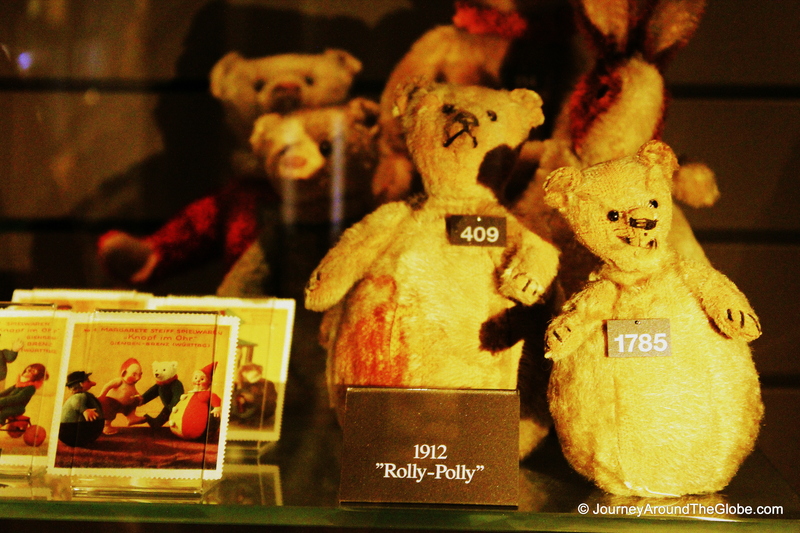 This 4 leveled museum boasts having the world’s greatest collection of teddy bears housing more than 2500 in their display. This interactive museum will give you a richly varied journey thru the world of teddy bears, impressive doll’s houses with detailed home décor of by-gone times, exclusive collection of dolls from all over the world from as early as the 19th century, perfect miniatures, and various carousels faithfully recreated models of the originals. I was as excited and amazed as my 6 years old daughter to check out each and every doll’s house/villa with fascinating details. My favorite part was the miniature world, which represent the old way of life-style for different earning levels in the society by recreating variety of shops (bakery, meat/fish market, fresh produce, and fashion), salon, church, carnivals, and many more. This is a fun as well as educational place for kids or adult, boys or girls. The museum is located in Barfüsserplatz, within walking distance of Marktplatz. 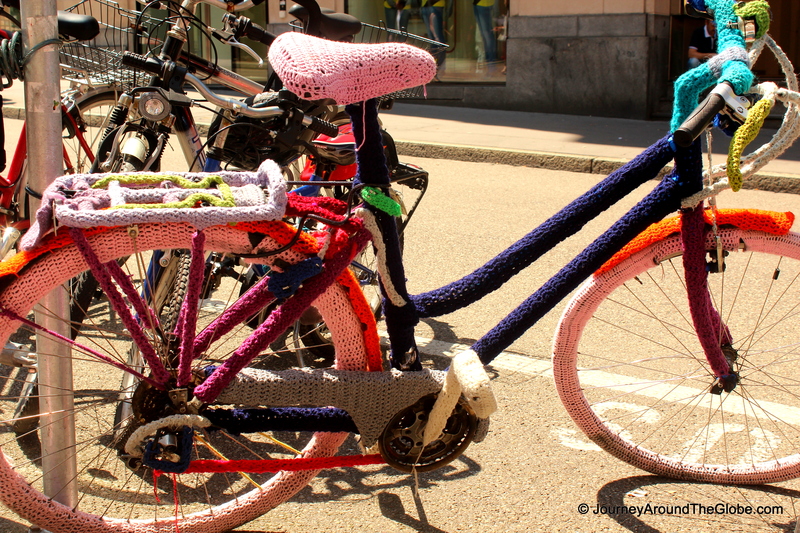 The fee is 7 CHF per person and children under 16 are free only when accompanied by an adult. They are open from 10am – 6pm every day. 6) MITTLERE RHEINBRÜCK (MIDDLE RHINE BRIDGE): Also known as the Central Bridge, this is the oldest existing bridge on River Rhine. Replacing its original bridge (partially wooden and partially stone) from 1225, a new stone bridge was completed around 1905. This is for cars as well as for pedestrians. It gives a very charming view of the city on both sides of the river. We went there around the sunset time to a nearby Chinese restaurant for dinner at one end of the bridge. The atmosphere was simply appealing and romantic. Also, the view of the bridge, curves of River Rhine, and river banks were marvelous as the sun was setting down. 7) LUCERNE: If you have a spare day in Basel and want to enjoy the Alps up close and personal, then Lucerne is a great choice for that. It is a picture perfect town with Lake Lucerne and the Alps. The drive was about an hour from Basel and made a perfect day trip for us, since we wanted to get some fresh Alpine air. 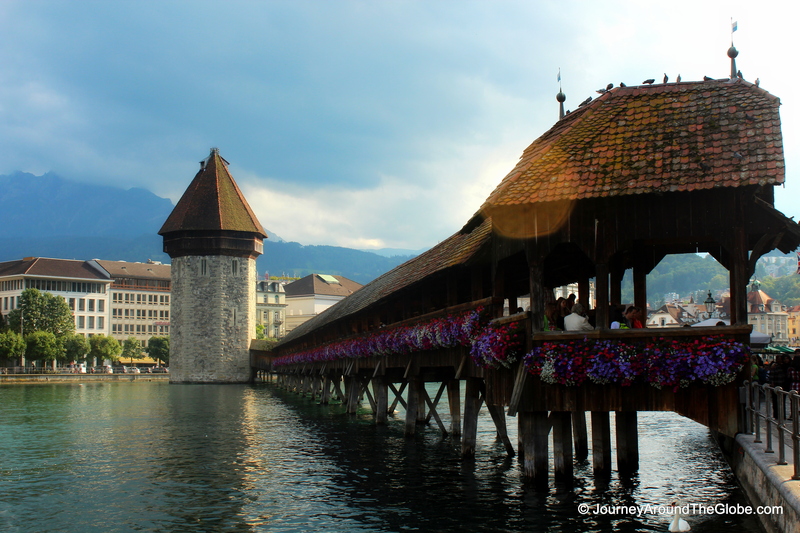 Check out the things you can do and see in Lucerne here. Your travel writing is getting better with time. I really enjoyed this piece. Now I know exactly what to do in Basel. Keep posting more stories of your trips. Just added this to my list of places I would like to visit. Beautiful pictures! Switzerland has been on my Bucket List for a while now. 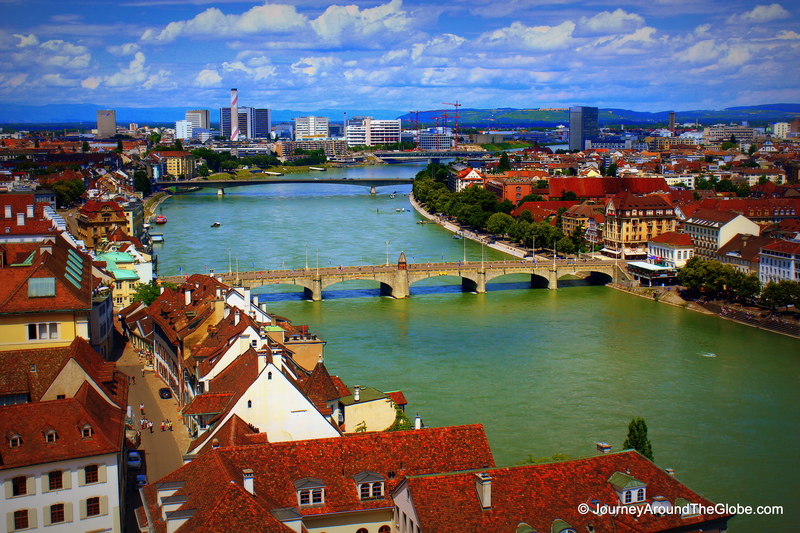 I was in Basel last year but your photo of the city from the top of Munsterplatz is great. Of course we did & we explored the beautiful Lucerne too.